The Clark's campus is the ideal setting for a snowshoe adventure! 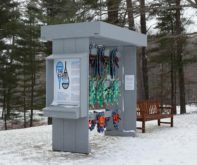 Visit the equipment rack near the Manton Research Center and borrow a pair of snowshoes to discover the beauty of our campus in winter. Take pictures, share them with #clarkart, and leave us a note in the snowshoe journal (look inside the desk on the side of the rack) to tell us about your snow trek! Snowshoeing is an enjoyable, but physically demanding, activity. Make certain that you are in good physical condition and able to complete your full route. For your safety: dress for winter weather conditions, carry a water bottle and/or snacks, take a phone with you, and take a copy of our trail map. Always hike with a companion. In an emergency, call the Clark's Security Office at 413 458 0412. Help us maintain this activity: if any equipment looks damaged, notify the Clark's staff and do not use it. Please rehang your equipment when finished using it. Equipment is made available for use at your own risk. The Clark's grounds are home to a number of wild animals, don't attempt to touch them. For additional details, see the legal disclaimer. The Clark’s campus is the ideal setting for a snowshoe adventure! Visit the equipment rack near the Manton Research Center and borrow a pair of snowshoes to discover the beauty of our campus in winter. Take pictures, share them with #clarkart, and leave us a note in the snowshoe journal (look inside the desk on the side of the rack) to tell us about your snow trek! In an emergency, call the Clark’s Security Office at 413 458 0412. Help us maintain this activity: if any equipment looks damaged, notify the Clark’s staff and do not use it. Equipment is made available for use at your own risk. The Clark’s grounds are home to a number of wild animals, don’t attempt to touch them. For additional details, see the legal disclaimer.